Colored pencils are made with the same fine pigments as oil and watercolor paints but the pigments are mixed with a binder and the product is formed into a pencil shape. A "traditional" colored pencil consists of pigment mixed with a wax binder surrounded by a wood casing, but colored pencils are manufactured with a variety of binders and can have a plastic casing, no casing at all, or can be produced in a stick form. You are probably already familiar with wax based colored pencils, since these are commonly used in schools by students and teachers. Oil based pencils are similar to wax based but use vegetable oil as a binder and tend to be harder than wax based pencils. Water-soluble pencils can contain either wax or oil but an emulsifier (like Gum Arabic) is added, allowing the pigment to be liquefied with water. These pencils can be used dry, dipped in water, or used with a wet brush. Although these three pencil types have different characteristics, they are compatible with each other and can be used together in creating artwork. It is important to use artist grade colored pencils for artwork. Artist quality pencils have more pigment than the student grade pencils you used in grade school. They are made of higher quality materials, are more lightfast, and are designed to layer and blend. You will not get the same results from student grade pencils. Prismacolor Premier Colored Pencils are the pencils most widely used by artists. They have soft, highly pigmented wax cores, are easy to blend, are widely available and moderately priced, come in sets or individual colors, and are available in about 150 colors. Other popular professional grade pencils include Caran d´Ache, Derwent, Faber-Castell, and Lyra. Although the pencils I’ve mentioned above are the most popular, you can find additional artist grade brands online. Artist quality pencils vary mainly in the hardness or softness of the binder, the amount of pigment in the in binder, the blending and layering qualities, the color selection, the lightfastness, and the price. Since colored pencils use the same pigments as other art mediums, their lightfast qualities are similar to other mediums. Some pigments are fugitive (i.e. will fade in direct sunlight); some are permanent and most fall somewhere in between. Lightfast qualities of Prismacolor Premier Colored Pencils can be found on the manufacturer’s website (www.prismacolor.com/faqs#Q23). Most manufacturers of artist grade colored pencils offer lightfast colors if you are worried about the permanency of your work. Colored pencils are amazingly versatile and can be used on a variety of surfaces, as long as the surface has adequate "tooth" for the pencil to stick to. Generally, the more "tooth" the surface has, the more layers of pencil it will accept. To insure that your artwork will last, always choose an archival (acid free) surface or prepare the surface with a gesso or acid-free workable fixative. Bristol Board is a favorite surface of colored pencil artists. It is available in several varieties (vellum or plate surfaces) and is a sturdy paper that accepts many layers of pencil and stands up well to erasing, burnishing, and other colored pencil techniques. Other popular paper surfaces for colored pencil include illustration board, colored art papers, pastel papers, Pastelbord, mat board, watercolor paper, and museum board. Mylar is a registered trademark (owned by Dupont Tejjin Films) for a specific family of plastic sheet products made from the resin Polyethylene Terephthalate (PET). There are different types of Mylar but the type available in art stores is semi-opaque, archival, and has a tooth on both sides that is receptive to colored pencil. Interesting effects can be obtained by applying colored pencil to both sides of a Mylar drawing. Artists have done beautiful colored pencil work on canvas, clayboard, masonite, tile, stone, wood, gourds, and other surfaces. 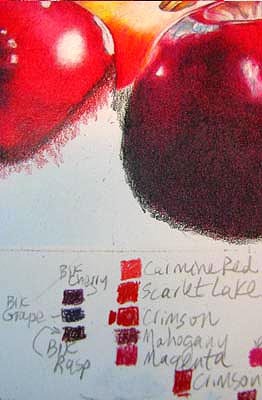 A huge range of effects can be created depending on the manner in which colored pencil is applied. Different strokes can be used (cross-hatching, circular, scrumbling, directional, etc.). The pencil can be applied very lightly or with firm pressure. It can be blended or unblended and applied in one or two layers or built up with dozens of layers. 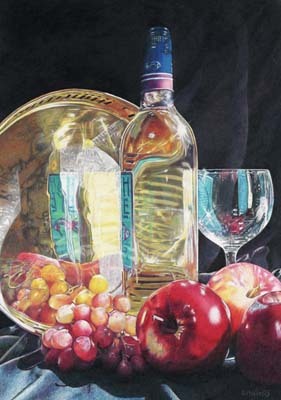 Colored pencil can be applied dry or used with a solvent. Gamsol or other solvents can be used with wax and oil based pencils and water can be used with water-soluble pencils. Colored pencil can be applied to heated surfaces. Stumps, trimmed brushes, fingers, tissues, and other tools can be used to blend and manipulate colored pencil and special effects can be obtained using a stylus, x-acto knife and other sharp objects. Burnishing is a method of blending by using a light colored pencil or a colorless blender on top of layers of colored pencil with enough pressure to smooth the underlying layers together. In effect, burnishing "polishes" the underlying layers, helping to fill in the tooth of the drawing surface, making the surface appear very smooth and even. Burnishing is especially helpful for portraying shiny or translucent surfaces and glowing, jewel-like colors.. It is a great idea to make a small test swatch of each color that you use in your painting, either in the painting's margin or on test strip. Label each color and keep the test strip handy as you work. These swatches help you judge how the colors will look next to each other before you use them and you can use your test strip to practice blending and layering colors before mixing them on your painting. This color record is also extremely helpful should you need to return to your painting after an extended period of time--It can be very difficult to remember what colors you used weeks or months ago! 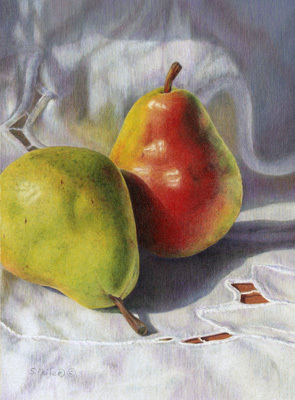 Because colored pencil is transparent, it is important that your underlying sketch not be too dark or it may "show throw" your finished piece, particularly under light colors. Graphite, either from a sketching pencil or from transfer paper, can sometimes smudge and possibly "muddy" light colored pencil so consider gently using a kneaded eraser to lighten all graphite lines as much as possible before you begin working on the light areas of your painting. For details about using transfer paper, please view the lesson "Using Transfer Paper". Wax bloom is a natural oxidation process of wax-based materials, just like rust is an oxidation of iron. 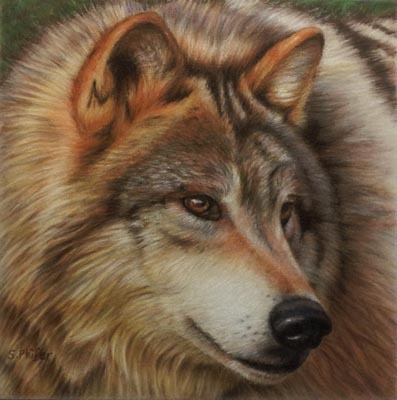 It appears as a cloudy white film over wax based colored pencil artwork and is most noticeable on dark colors, in warm climates, or on very heavy layers of colored pencil. 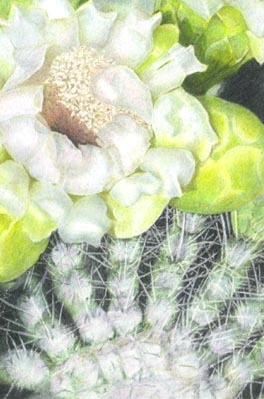 Gently wiping your drawing with a tissue or clean, dry cloth will remove wax bloom. To avoid wax bloom on your completed colored pencil artwork, gently wipe it and then spray it with a workable fixative to seal out air. 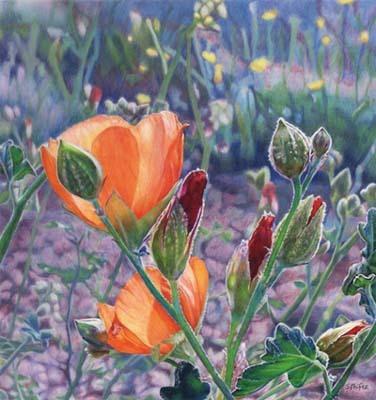 Colored pencil artwork should be treated like any piece of fine art and should be professionally framed using only acid free archival (or museum quality) materials. Never hang your colored pencil art where it will receive direct sunlight. Over time even a small amount of the ultraviolet light in sunlight can begin to fade the pigments and damage the drawing surface.